The state holds a record of maximum number of organ donations and performing maximum organ transplantations across the state. Chennai: National Organ and Tissue Transplant Organisation (NOTTO) and the Union health ministry awarded Tamil Nadu for the highest number of transplantations in any state across the country for the fourth consecutive year on Tuesday. The state holds a record of maximum number of organ donations and performing maximum organ transplantations across the state. So far, 6,886 organ donations have taken place with around 1,198 organ donors from Tamil Nadu. Around 933 organ donations took place last year and as on date, the state has 9,602 pledged donors. 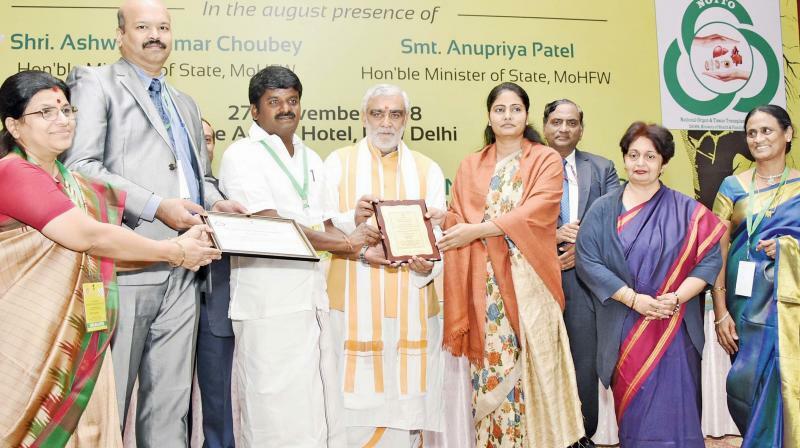 State health minister C. Vijayabaskar received the award at a ceremony in New Delhi on Tuesday presented by the Ashwini Kumar Choubey, minister of State, ministry of ministry of health and family welfare and Anupriya Patel, minister of state ministry of health and family welfare. Preeti Sudan, secretary, health and family welfare, Dr. Vasanthi Ramesh, director, NOTTO and Dr. Venkatesh, director general of health service, ministry of health and family welfare were also present at the ceremony. “Organ transplantation needs of the poor patients are taken of by both government hospitals and private hospitals free of cost. Under Chief Minister’s Comprehensive Health Insurance Scheme (CMCHIS), government of Tamil Nadu sanctions up to Rs 35 lakhs for transplantation, which is the highest ever in India. The British Medical Journal had exhorted other states to emulate Tamil Nadu’s model,” said C Vijayabaskar. Tamil Nadu has also achieved maximum organ utilization from the diseased donor and successful multi-organ transplantation. Tamil Nadu is the first State to do successful hand transplant at Stanley Medical College and Hospital.